Texas is no stranger to droughts. After a severe 2014 drought, The North Texas Municipal District (NTMWD) needed a new method to communicate water conservation to its rapidly growing customer base. Using a youth-centered theory of change model, I determined youth could spark water conversations among adults at home. Water4Otter is a free, 45-minute performance that inspires Kindergarten - 5th grade youth to be "water savers.” The program content is localized for the 1.6 million customers of NTMWD, emphasizing knowledge of local water source and local treatment processes. A combination of quantitative data and in-home contextual inquiry resulted in a big insight: people are more likely to conserve water if they know their water source. I used this key piece of research and synthesized it for a wide elementary school audience. Water delivery systems aren’t simple. They include multiple water sources, treatment plants, wastewater management- most of which are new concepts to elementary students. This early concept map on a whiteboard helped me transition the extensive research into something tangible and intriguing to a third-grade audience. The client wanted youth and entire families to know their water source, Lake Lavon. But the journey to tell a compelling water story begins with a compelling character. Otis the Otter is the hero of the Water4Otter. I formed Otis’ journey based around storytelling best practices; an inciting event, rising actions, and a climax. The story arc, championed by Aristotle and middle school English teachers alike, is an indispensable tool to create tension and develop a memorable story. 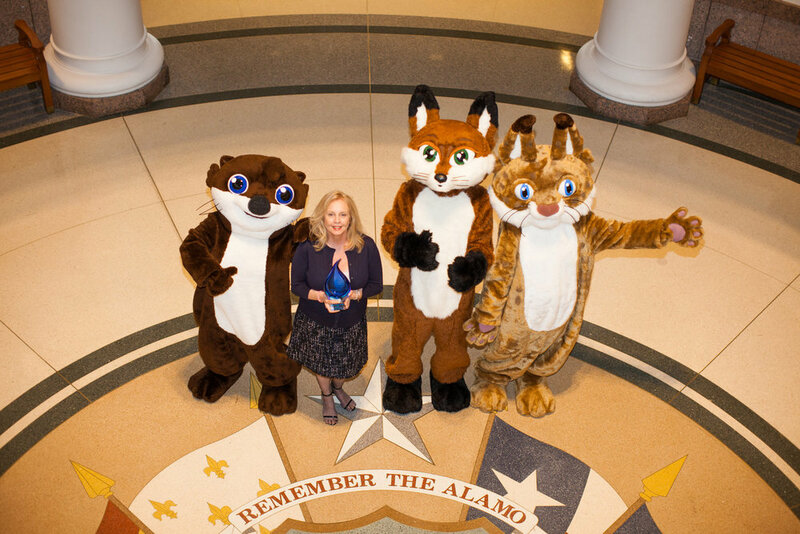 Water4Otter’s goal is to get Texas children to talk to their parents about water. Youth become advocates for Otis, as they learn that they share the same water with North American river otters who live near Lake Lavon. The performance builds upon the research by adding an empathic element- a connection between youth and the animals that use the same water. Within the program’s first two years, I helped develop “clings” which every student would take home. Featuring character icons and water facts, youth are encouraged to place clings around their home to start the water-saving conversation. Lastly, Otis became something of a local celebrity, with his appearances in the community and the local Frisco RoughRiders AAA baseball team.